1001 colour combinations for your eyes! The pro-level palette is truly the Ultimate Shadow Palettes featuring 16 expertly coordinated colour combination eyeshadows, from naturals to smokies to pop. Each set features a vivid mix of velvety-rich textures and mesmerising finishes that range from mattes and satins to shimmers and metallics. 16 professionally coordinated high-performance eye shadows. Velvety shades and highly pigmented. The range of finishes allows different looks from smokey to natural to pop. Additional Information : NYX Professional Makeup is a leading US Based makeup brand loved globally by all beauty lovers and professional makeup artists.NYX Professional Makeup offers an exceptional quality of professional makeup & beauty products in super stylish and modern packaging.The Brand has a variety of cosmetics ranging from their highly pigmented and striking lipsticks and glosses, eye-catching eyeshadows, eye and lip liners, high coverage base makeup foundation, concealers and primers for all skin types along with stunning eye palettes, eyeshadows and makeup brushes to choose from. Explore the entire range of Eye Palettes available on Nykaa. 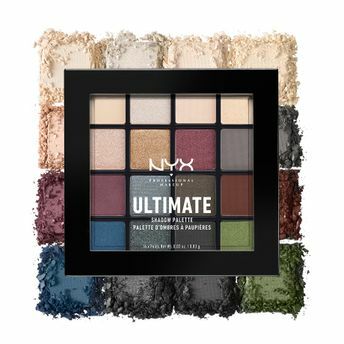 Shop more NYX Professional Makeup products here.You can browse through the complete world of NYX Professional Makeup Eye Palettes .Alternatively, you can also find many more products from the NYX Professional Makeup Ultimate Shadow Palette range.